President Barack Obama is popular with many people around the world, especially in Europe, Africa and parts of the Asia/Pacific region. Nonetheless, positive views of Obama’s presidency have slipped somewhat since 2009, with confidence in the American president and approval of his foreign policies dropping in most countries surveyed over the past four years, in some cases significantly. Many publics around the world have confidence in President Obama to do the right thing in world affairs. At least half in 24 of the 39 countries surveyed give the American leader high marks, though there is large regional variation. Majorities throughout much of Europe as well as in the U.S. and Canada express confidence in Obama’s handling of global issues. This includes at least eight-in-ten in Germany (88%), France (83%) and Canada (81%). Poles, Russians and Greeks, meanwhile, are much less likely to say they trust Obama to do the right thing. Publics in Africa and the Asia/Pacific region also give Obama high marks. In Africa, clear majorities in nearly every country surveyed say they have confidence in the U.S. president, including 81% in Kenya, the land of his father’s birth. 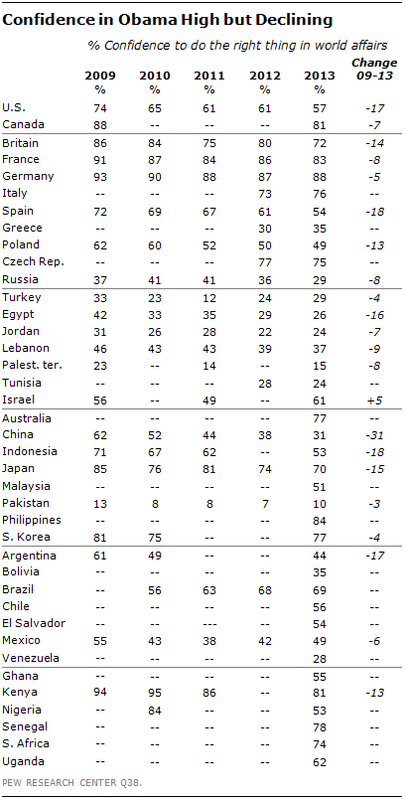 In the Asia/Pacific region, at least half in most countries trust Obama to do the right thing in world affairs. The Chinese (31%) and Pakistanis (10%) are much less likely to agree. Opinion is more divided in Latin America. While roughly half or more express confidence in Obama in Brazil, Chile, El Salvador and Mexico, many fewer say the same in the other countries surveyed. Venezuelans are particularly unlikely to give the U.S. leader good marks. Among the regions surveyed, people in the Middle East express the lowest levels of confidence in President Obama. 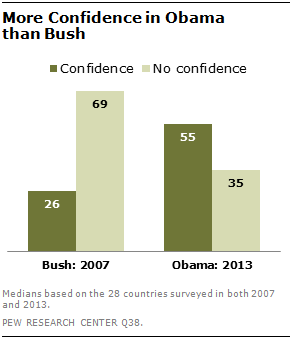 About three-in-ten or fewer in most countries say they trust Obama to do the right thing in global affairs. The one exception is Israel, where 61% have confidence in the American leader. Despite high marks from most publics, confidence in the U.S. president has decreased over Obama’s first term in office. There have been double-digit declines since 2009 in 10 of the 22 countries surveyed in both years. The drop in trust has been particularly large in China, where 62% of the public expressed confidence in Obama in 2009, but just 31% do so today. Nonetheless, Obama is still rated more highly than President George W. Bush was in most countries surveyed in 2007 and 2013. The gap in confidence in the two American leaders is especially large in Europe. But even in the Middle East, where both presidents received low ratings, the Turks, Egyptians and Jordanians are much more likely to have confidence in Obama than they did in Bush. Many around the world approve of Obama’s international policies, though in most countries his foreign policy agenda is less popular now than in 2009. Today, broad majorities in Canada and much of Europe endorse Obama’s international policies, and 53% in the U.S. agree. Greeks and Russians offer much less positive evaluations of Obama’s performance. In many Asian and African countries, majorities support Obama’s international policies. However, compared with general confidence in the U.S. leader, approval of Obama’s policies tends to be lower in these two regions. For example, while 51% of Malaysians trust Obama to do the right thing in world affairs, just 28% endorse his foreign policies. Similarly, 62% in Uganda say they have confidence in Obama, but only 46% offer a positive evaluation of his policies. In Latin America, Brazil and El Salvador are the only countries surveyed where majorities approve of Obama’s international policies. Venezuelans are the least likely to express support. Publics in the Middle East give Obama’s foreign policy agenda very low marks. In most of the countries surveyed, roughly two-in-ten or fewer support his international policies. Israelis again stand out – 57% endorse Obama’s policies. Nonetheless, the honeymoon with Obama may be over for many publics. Among the 22 countries surveyed in 2009 and 2013, approval of Obama’s international policies has dropped by roughly 20 percentage points or more over the past four years in China (-34), Indonesia (-24), Argentina (-24), the Palestinian territories (-22), Egypt (-21) and Kenya (-19). In most of the other countries surveyed in both years, approval has declined by at least ten percentage points. Obama’s Re-Election and Views of the U.S. Despite a decline in positive evaluations of Obama, many around the world say that his re-election led them to have a more favorable opinion of the U.S. In 22 of 38 countries across North America, Europe, Africa, Latin America and Asia, pluralities or majorities say the 2012 election improved their image of America. In many of the remaining countries surveyed, the consensus is that Obama’s re-election did not change people’s opinions of the U.S. For example, 62% in Russia, 54% in Greece, 41% in Argentina, 40% in Lebanon and 40% in Jordan volunteer that the 2012 election made no difference in how they feel about the U.S.
Egypt is the only country surveyed where a plurality of people say they now have a more negative image of the U.S. because of Obama’s re-election. Nevertheless, U.S. favorability has remained stable in Egypt over the past few years: between 15% and 20% each year since 2010 say they have a positive opinion of the U.S.
As with confidence in the U.S. president, reactions to Obama’s re-election are very different than reactions to Bush’s re-election. In most countries surveyed in both 2005 and 2013, people were much more likely to say that Bush’s re-election led them to have a less favorable opinion of the U.S. than to say the same about Obama’s re-election. For example, at least half of the publics in Germany, Canada, France, Britain, Turkey, Spain, Lebanon and Indonesia said Bush’s re-election tarnished their image of the U.S. By comparison, roughly a third or fewer in each country say the same about Obama’s re-election. Russians and Pakistanis were also significantly more likely to say their opinion of the U.S. soured after Bush’s re-election than to say the same about Obama.